Today is Mother’s Day in the United Kingdom. Did I send my mother a card? Did I arrange for flowers to be delivered? Or chocolates? No, I didn’t. Sadder than that, my mother didn’t expect me to, either. In nine years of living here, I’m not sure I ever have managed such a simple thing. It’s not that I don’t love my mother, you understand. I adore her. It’s simply that Mother’s Day in the UK is on a different day to the American equivalent. And since I don’t have a UK diary, I have no way of knowing when it’s coming – until I see lots of messages on Facebook and twitter, by which stage it is too late to do anything other than make an apologetic phone call. The news that I forgot again has hit me much harder this year, though. With my novelist’s nose for overwrought metaphor, my failure to remember Mother’s Day stands as sorry testament to the gulf that lies between where I came from and where I live now. My parents have been such rocks for me this year. They have given me boundless support through the most difficult twelve months of my life. They have suffered – more, I suspect, than I will ever know – through my protracted and painful divorce. They have been there to pick me up and brush me off when things have really gotten rough (and boy, did things get rough.) They have not judged me when I have made mistakes. Their love has been steady, and constant, and strong. And utterly humbling. I’m a parent. And I get it – this is what parents do. We would lie down in front of a train for our children. But today’s failure to say thank you for all that my mother has done, after the year we have all gone through, has left me rather sad. We spoke on the telephone a little while ago – of course, she couldn’t care less about the lack of a card or flowers, and had no time for my abject apologies. She expects no fanfare or effusive displays of thanks on this particular day (or any other.) She knows that I love her, and that my children love her. All she cares about is that we are well. She just quietly gets on with her job – ferociously loving us from afar and worrying about us all – with a quiet determination that still leaves me awestruck. Thanks, Mum. You absolute beauty. A lovely tribute to a beautiful lady. What a picture! You are indeed fortunate to have such a gem of a mother. Treasure every word you share, and every moment you get to spend with her….I miss mine–and my dad–every single day. What a great post–I’m sure it’s a wonderful present to her in and of itself. 1. 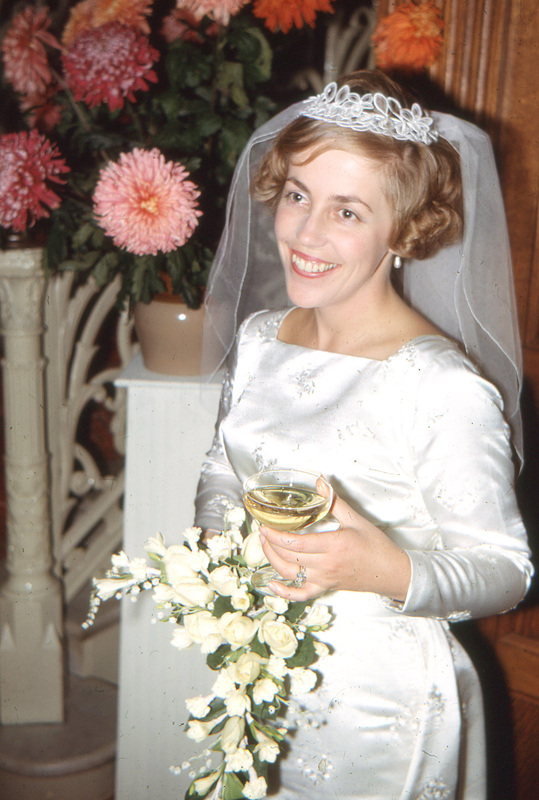 I love that you have a picture of your “mum” on her wedding day looking stunning with a champagne glass in hand. She looks like she is on cloud nine. 2. This post was a sweeter gift than any bouquet of flowers or frilly card would be. She can read this over and over again and feel the love through your words. As a mom of your mum’s vintage, I second all of the above sentiments and offer a guilt reduction plan. My mother’s birthday was the day after Christmas and easily lost in the annual holiday chaos. I used to give her surprise birthday parties in the spring. She died this year, dearly loved and sorely missed. There is nothing to keep you from proclaiming your own Mother’s Day on any date (better yet, dates) of your choosing, making it even more special than the officially sanctioned holiday. A word wrangler of your caliber will always have just the right words for the occasion, no help from Hallmark required. Cheryl – first of all, my condolences on the loss of your mother. Secondly, thank you very much for writing and for sharing your thoughts. I love your idea, and will henceforth declare random days to be Mother’s Day… that will keep her on her toes!